A mysterious, gun-toting stranger wanders the woods. Three twenty-somethings head out for some time away from society, looking forward to a vacation of camping and riding the rapids. Of course, their paths are going to cross. Of course, there will be a body count. However, as straightforward as the setup might seem, not everything in Blood Money goes as expected. Director Lucky McKee and screenwriters Jared Butler and Lars Norberg take a standard premise and tweak it sufficiently to make it interesting and, at times, even darkly humorous. There’s a taste of The Treasure of the Sierra Madre in how things turn out. Initially, we might think that Miller (John Cusack) is a cold-blooded killer. He mostly looks and acts the part. His goal, however, isn’t exterminating innocent campers – he wants the four bags of money he embezzled and dropped out of a plane. The trio of Lynn (Willa Fitzgerald), Victor (Ellar Coltrane), and Jeff (Jacob Artist) are in his way, however, because they find the money before Miller can retrieve it. Although Victor thinks removing it from the woods is a bad idea, Lynn and Jeff disagree. That, plus elements of a romantic triangle, cause a fracture in the group – one that Miller is all-too-willing to exploit until things go really wrong. In a traditional thriller of this sort, Victor, Lynn, and Jeff would be the “good guys” and Miller would be the villain. In Blood Money, however, things aren’t that straightforward. It starts with the canny casting of John Cusack, who is one of the most earnest and likable actors of his generation. He plays Miller as more snarky than homicidal and we can’t help but developing a rooting interest in him. This is enhanced because Lynn in particular isn’t very appealing. She delights in playing Victor and Jeff against one another and her primary motivation in all of this is naked self-interest. Understandably, because of his name recognition, Cusack gets top billing even though he doesn’t have the most screen time. In fact, during the first half, he’s mostly in the background. The three friends are front-and-center and we become privy to the way their seeming affinity unravels. From an acting perspective, Ellar Coltrane (whose development from childhood to adolescence was central to Richard Linklater’s Boyhood) is the most convincing. Willa Fitzgerald has a tendency to be shrill and over-the-top. Jacob Artist is so low-key that he often fades into the background. Although much of the film, including large parts of the second half, evolves as anticipated, the movie’s climax isn’t afraid to detour into the realm of the unexpected. In fact, the ending is more unsettling than satisfying. This is good for those who prefer their thrillers to deviate from the paint-by-numbers approach that most exhibit. It’s not so good for those who aren’t appreciative of stories that end with a note of ambiguity. 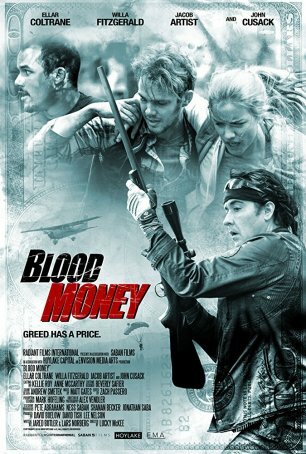 Despite the Deliverance vibe that permeates the production, Blood Money delivers a bit more.